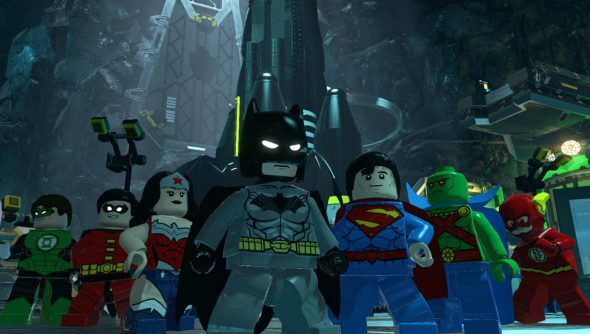 The Caped Crusader and chums (and foes) begin their fight against Brainiac in Lego Batman 3: Beyond Gotham on November 11th in North America and November 14th over here in Blighty, Warner Bros. has announced. Expect the big names like Batman and Superman along with the likes of Plastic Man and Zatanna in the 150-large roster of heroes and villains. Lego Batman 3 takes the action away from Earth and out into the cosmos as the wee Lego supers hunt down Lantern rings in a bid to stop Brainiac putting everything in bottles. So we’re going to get to see a whole heap of aliens worlds filled with Lego bricks. While the tried and tested formula of light puzzles and super-powered brawling returns, Traveller’s Tales promises some twists thanks to the power of the Lantern rings, which are fuelled by the spectrum of emotions like… erm… willpower, fear and purple. It sounds like good times, but what the Lego games really need is some online co-op. Couch co-op is great, but it has become increasingly challenging to talk 30-year-olds into joining me for some Lego fun.